We are cooking on a chimney starter with a grill pan to nicely char our head of Cauliflower for this recipe! A cousin to broccoli, #cauliflower is one of those vegetables that can be eaten raw or cooked and converted to so many different textures. Best yet, cauliflower is one of those super cancer-fighting foods as it contains sulforaphane known to kill cancer stem cells. I’ll be taking my head of cauliflower and introducing it to hot coals, first, direct heat using a #chimneystarter for the actual cooking and then directly on the hot coals to give it the perfect “meat” char. No matter what color you enjoy – white, yellow, purple – grab a head and get your chimney starter ready, as I show you how to use a chimney starter as an actual grill. To start, I place a mesh screen on the charcoal grill grate to help retain the small, hot coals for cooking. I have a collection of micro charcoal pieces that work perfectly for this type of cooking. After lighting a Firestarter, I place the charcoal filled chimney starter on top of the Firestarter and allow the coals to burn down to hot embers. Hot embers are what I will be using to cook my fresh cauliflower, first, directly on the chimney starter, then on the mesh screen once I dump the hot embers from the chimney starter. Cauliflower is so simple to prepare for chimney starter coal cooking. Just remove the thick stem and the green leaves, then cut in half. I’ll be placing a griddle pan directly over the chimney starter for the start of the cooking. I first drizzle a couple of tablespoons of a high heat tolerant oil over the cauliflower (I’m using avocado oil). Allow that to cook while you melt butter which will be poured over the cauliflower. I melt the butter directly on the grill while the cauliflower is cooking. Allow this to char the cauliflower on the griddle for about 12 minutes. We just want enough tenderness to allow the direct coal cooking to provide the flavor. After the cauliflower has produced some tenderness while direct cooking over the chimney starter, it’s time to remove the griddle pan and dump the hot coals onto the mesh. You’ll see I’ve placed a large wood chunk just off the hot coals to produce some additional wood-fired flavor. Now in goes the cauliflower steaks. I position them right on the hot coals. Don’t turn or disturb these pieces for a least 8 minutes at which time, flip the cauliflower to char the other side. This is what produces the fabulous “meaty” char taste and why cauliflower is done on the grill is often referred to as a cauliflower steak. If you will use the cauliflower in a recipe, then cooking about 12 minutes on the coals will be enough. If enjoying as is, then cook slightly longer and enjoy. This truly is the easiest method of cooking a single head of cauliflower for a true char flavor. Which I will be taking to a cauliflower rice recipe that’s coming up! Have you ever cooked directly on a chimney starter? Leave us a comment to share. Bringing innovation to wood-fired cooking with recipes, techniques and the science behind the fire, smoke, and flavor. That’s SmokinLicious®. More Related reading on Grilling ideas beyond cooking on a #chimneystarter ! 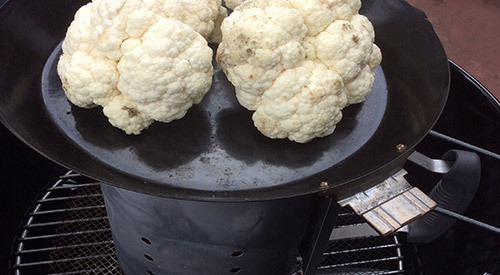 Dr. Smoke- Only need to char up a head of Cauliflower, do your cooking on a chimney starter instead of lighting the grill!